Cheetah Anatomy, habitat, distribution, feeding, reproduction, evolution, social structure, conservation. Cheetah images, videos and top facts. The Cheetah is the only feline member of the Acinonyx genus. They are the fastest land animal in the entire world. That is part of their claim to fame and they also have amazing spots on their bodies. The spots are unique for them just like the fingerprints of a human are. There are quite a few references to the Cheetah throughout history. They were often trained by members of aristocracy and used to help them hunt for various types of food. They were also a social status of wealth in the past. Women would wear expensive Cheetah fur coats. The gorgeous rosettes on the fur were considered to be very attractive. In the wild the Cheetah lives in Africa, Asia, and areas of Iran. They don’t adapt well to changes so those in captivity are often those that are born there. In the wild these animals live in a variety of locations. They are able to survive in the hot desert areas and along the open plains. They live in areas where there are lots of tall grass to help them to remain hidden. There are also mountain terrain areas where these animals are able to survive. The Cheetah is a meat eater and will hunt a variety of animals. They tend to stick to those that are about 85 pounds or less. These animals include antelope, gazelle, zebra, and wildebeest. They hunt for food at night and spend their day time hours resting. They have excellent vision that allows them to see their prey from very far away. They hunt early in the morning and then in the evening. The Cheetah is categorized as the fastest animal on land in the entire world. 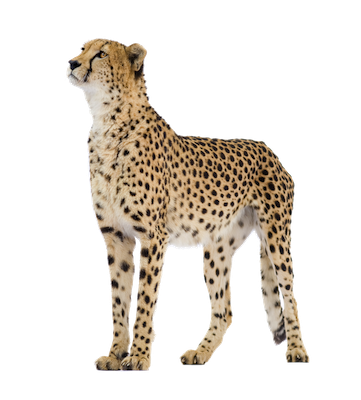 Cheetahs can reach speeds of up to 75 miles per hour. The future for the Cheetah is one of great uncertainty. Humans continue to move into the same areas that they once freely roamed. Many of them are poached and killed so that they can stop being a threat to the area. Poaching also occurs for the glorious skins of these animals. Even though it isn’t as common as it once was the damage has been done in reference to the number of them that remain. Reproduction is very slow for the Cheetah (every 15-19 months) and that also contributes to problems for them to thrive. Experts have been able to identify a couple of problems for them regarding the natural mating process. There is a very low sperm count among the males so even when mating occurs it won’t always result in offspring being produced. There is also very little variation among the genetic profile of the Cheetah. As the numbers get smaller and smaller that genetic pool also becomes more shallow. In a controlled setting there are breeding programs. Every effort is made to diversity the genetic makeup of the new offspring as possible. Several species of the Cheetah have already become extinct based on the fossil remains that have been located in areas of Asia. It is believed that these animals moved from Africa into Asia after Miocene. Only time will tell if the aggressive conservation efforts in place will be enough for them to survive. It is estimated that only 8,500 of the Cheetah remain in the wild today. There are some programs in India that involve carefully selecting which pairs will be able to breed. The hope is to diversify the genetics as much as possible. There are also plans to hopefully introduce some of these animals into the wild at a later point in time. Some worry though that they won’t be able to make such a transformation.